Sacred Justice includes a large collection of previously unpublished letters, found in the upstairs study of the author's grandfather, Aaron Sachaklian, one of the leaders of Nemesis, that show the strategies, personalities, plans, and dedication of Soghomon Tehlirian, who killed Talaat Pasha, a genocide leader; Shahan Natalie, the agent on the ground in Europe; Armen Garo, the center of Operation Nemesis; Aaron Sachaklian, the logistics and finance officer; and others involved with Nemesis. 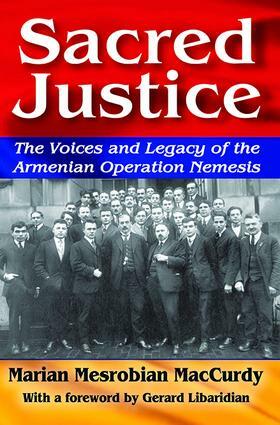 Marian Mesrobian MacCurdy tells a story that has been either hidden by the necessity of silence or ignored in spite of victims' narratives—the story of those who attempted to seek justice for the victims of genocide and the effect this effort had on them and on their families. Ultimately, this volume reveals how the narratives of resistance and trauma can play out in the next generation and how this resistance can promote resilience.